ATI has always been one of those participants of the consumer video chip market, who pay much attention to constant improvement of video processing technologies in its products. Just remember the most complete support for MPEG2 decoding (hardware implementation of motion compensation and iDCT) in Rage 128 video chips, All-In-Wonder products, and the recent processors for mobile use. The company never stops at what has been accomplished and together with the announcement of the new X1000 series video chips (to be more exact, even earlier), they unveiled a new technology, even a whole set of technologies, which got the general marketing name AVIVO. 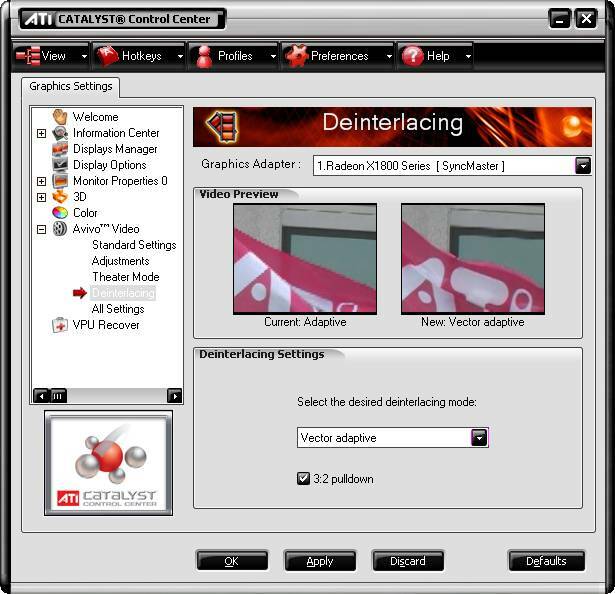 ATI AVIVO is a set of ATI video technologies, intended for further improvement of quality and performance of the existing proprietary technologies from this company. It includes a great number of various technologies, implemented in the new series of RADEON X1000 video chips. AVIVO is notable for its wide applicability, it's not just an improvement of a certain pipeline stage that processes video. This suite in designed to improve all the stages. According to ATI, AVIVO technologies provide the highest video playback quality on its hardware solutions, designed with AVIVO support. All stages of the video pipeline should demonstrate improvements, starting from capture and encode to decode, process, and display. Here are some of them: 12-bit processing of captured data, new features of hardware video encoding (H.264) and assisting general-purpose processors in encoding, improved algorithm of adaptive de-interlacing, two built-in Dual Link DVI Outs. It should be stressed that AVIVO is not just support for new features in video cards' drivers, it's support for new hardware technologies in modern products from this company: new generation RADEON X1000 and Theater 550 Pro. Thanks to new technologies and programmable video processing units these solutions are intended to increase quality and improve performance of processing media data. These tasks are getting increasingly important, as improvements in video content processing on PCs resulted in the appearance of media centers, based on PCs, intended for home theatres. Besides, High Definition Video is getting increasingly popular and it required much from the quality as well as performance of the video pipeline. And now we are going to briefly review these new AVIVO features. It will be a purely theoretical article devoted to a description of the main technologies, all practical tests will follow. The practical section will be divided into several parts, as the set of technologies is wide and diverse, each section will be reviewed in detail in future. Video capture is a process of converting analog video data into a digital format in order to process, store, decode, and display it during the subsequent stages of the video pipeline. In case of analog capture, a video signal is separated from a carrier and then digitized. A lot of factors influence the quality of video capture. High-quality capture is characterized by a high quality of signal separation, analog-digital conversion of high capacity, high-quality noise reduction, etc. New ATI solutions for video capture, starting from Theater 550 Pro, can dynamically change the input signal level in order to provide video signal of the highest quality (brightness and contrast) for further processing. According to ATI, AVIVO must provide the most realistic brightness and contrast of captured video. The process of converting analog signal into digital form is the main stage of video capture, much depends on it. All conversion inaccuracies will be lost for the rest of the video pipeline. It's very important to get maximum details at this stage. For this purpose ATI decided to use 12-bit analog-digital conversion, unlike previous 9- or 10-bit solutions. It must provide good capture results on the whole, especially improve smooth color transitions. Comb filtering is a preprocessing stage that separates color and brightness components of analog video (TV and composite signal). As a rule, filtering separates them into a single image (this method is called 2D comb filtering), but the improved filter from ATI works in three dimensions, using two regular dimensions of the image and time as the third one. It improves the quality of component signal separation. Noise is parasitic information in a video signal in the form of small variations between neighboring dots in brightness or color, usually looking as hardly noticeable snow. Noisy signal has a negative effect not only on the human visual perception of the image. It will also require more efforts to encode video and the resulting files have higher bitrates than there might have been. Hardware noise reduction in AVIVO serves to lower the noise level to improve video quality and increase its encode efficiency. A usual task you have to solve after capturing video from an analog source and converting it into digital form is to compress the data into some of the formats, for example, into MPEG2 or a better one. Even if the video source was digital, you often have to convert video into another format or into the same format with different resolution and/or bitrate. Decoding video from one format and encoding it into another is called transcoding. It may be used in some cases, when for example you want to watch a DVD movie on your pocket device: handheld, mobile headset, or a pocket game console, that is devices with different video resolutions, formats and bitrates supported. ATI solutions with AVIVO support offer two different features to compress video. Products for analog video capture, based on Theater 550 chips, have separate units dedicated to fully hardware MPEG2 encoding, which is important for keeping the CPU load low (approximately 3-5% of CPU resources for encoding a TV signal). The other solutions with AVIVO support, video cards, and future video cores integrated into chipsets offer video encoding and transcoding with partial hardware support. All the new video chips from the ATI RADEON X1000 series support firmware transcoding, the only requirement is to install proper software. All the previous utilities for transcoding video used only general-purpose processors, but ATI's AVIVO Video Converter additionally employs features of ATI X1000 series video chips. The converter works only on a PC with proper video cards installed - it supports all chips from the series, from X1300 to X1800 XT. The current beta supports the following profiles and output formats: MPEG1, MPEG2, Video CD, Super Video CD, DVD, MPEG4 (DivX compatible), WMV9, Portable Media Center, H.264 (AVI), MPEG4 (for Sony PSP), and H.264 (MP4, for Apple iPod). Video playback requires much resources even on modern systems, especially high definition video and modern encoding formats, which are quite resource-intensive. The main load falls on a CPU, hence the main requirements to its capacity. But modern video cards may take up part of decode and post-process calculations using a video chip. The less CPU resources decoding consumes the better. It results in reduced power consumption, which is especially important for mobile use. Less powerful CPUs will also be able to decode video, which will lower the costs and increase the playback quality on low-power systems. A larger part of CPU resources will go to processing video or to other tasks, running in an operating system. ATI video chips have separate units for decoding video, they are flexible and can be programmed to use optimizations for various video codecs. The technology that takes advantage of video chip features for video playback is called DirectX Video Acceleration (DXVA). DXVA allows to use a video processor for several tasks simultaneously, for example, for decoding video and post processing (de-interlacing is used most frequently). The current video decoding features of X1000-series chips include support for MPEG2, WMV9, and H.264. We need special decoders (ATI DVD Decoder, Cyberlink H.264 video decoder) as well as players with DXVA support. DXVA decoders initially appeared for MPEG2, then there appeared an add-on to Windows Media Player 10 with DXVA support for WMV9 decoding. Now that the proper decoder from Cyberlink is released, DXVA is also available for H.264 format. Decoding is clearly defined by an algorithm, its quality can be measured not only in the quality of the resulting image, but also in resource consumption, CPU load. The decode process consists of several stages, which may differ in each given codec. For example, here are the stages for H.264: reverse entropy, inverse transform, motion compensation, in-loop deblocking, post processing and displaying. H.264 is a modern video codec with high compression, the first version of the standard was finished in spring 2003. H.264 is accepted by Motion Picture Experts Group (MPEG) and is sometimes called "MPEG-4 Part 10" (MPEG-4 Part 10, ISO 14496-10) or "AVC" (MPEG4 Advanced Video Coding). It's the most promising codec, which is part of the HD-DVD and Blu-ray specifications. It will also be used in DTV broadcasting. As for today, the universally recognized and most often used format is MPEG2. MPEG2 is used for encoding DVD video, for streaming video in Internet, and for the majority of DTV broadcasting (air, satellite, cable). Compared to MPEG2, the H.264 format offers a better quality/bitrate ratio, providing increased quality at the same bitrates or smaller bitrate with the same quality. Besides, H.264 possesses better scalability. This format supports several profiles for various devices and suites perfectly both low bitrates (for example, for mobile phones) as well as very high ones (future optical media HD-DVD and Blu-ray). New methods, similar to H.264, have been developed because of the relatively low efficiency of MPEG2 and other old codecs, increased computational resources, and the propagation of High Definition Video, which needs more efficient encoding methods. More complex schemes of entropy coding of a stream: Context-Adaptive Variable Length Coding and Context-Adaptive Binary Arithmetic Coding versus one fixed scheme in MPEG2. CAVLC - standard H.264 compression method, CABAC is an advanced method, which can reduce the bitrate by 10-20%. Both methods provide compression of a higher quality, but they require much more computational resources compared to the MPEG2 scheme. Adaptive Deblocking Filter. H.264 executes this deblocking filter using 4x4 blocks. Unlike MPEG4 post-processing, the in-loop filter works at encode and decode stages; each frame is filtered before it's used for decoding/encoding the next frames. That's why such filtering is mandatory for H.264 now, it cannot be disabled. Besides increased quality, especially with low bitrates, it means serious growth of computational load of decoding an H.264 stream. Variable block size. Unlike MPEG2 and MPEG4/ASP, where the minimum macro block sizes are 16x16 and 8x8 pixels correspondingly, H.264/AVC uses blocks of up to 4x4 pixels, the block size changing adaptively for each fragment. It helps in highly detailed scenes and provides better resulting quality. Improved accuracy of motion detection (object drifts in a frame). H.264 uses the increased definition for evaluating motion of a quarter of a pixel (Quarter-Pel or QPel). Intraframe coding. This technique compresses similar colors better than MPEG2, especially in hard-to-encode scenes with fast motion. Thanks to this feature, similar fragments are encoded with a lower bitrate. The key peculiarity of H.264 format is that it has been developed for much higher compressions than MPEG2. Of course, the increased compression (2-3 times as high as in MPEG2) comes at the cost of much more computational resources for encoding and decoding. It refers to the entire decoding process, but especially to entropy coding, reduced block size, and deblocking filter. H.264 yields better quality at the same bitrate: less block artifacts, smoother color transitions, etc; its requirements to media volumes and bitrates are less severe. In return, H.264 stream requires 3-4 times as much resources to decode as MPEG2. 1080i/1080p video stream in MPEG2 format with a higher bitrate will use 3-4 times as little computational resources as H.264. Even the fastest CPUs cannot meet the H.264 decode requirements in the highest resolutions, such as 1080p (progressive 1920x1080), which are expected on Blu-ray and HD-DVD media and already exist in the form of various high-quality video clips. A similar situation was with DVD playback in the very beginning, when CPUs did not cope with MPEG2 decoding and video cards came to the rescue. This time the situation is similar, the latest ATI video cards offer hardware acceleration for H.264 decoding, which allows to solve this problem. All X1000-series video cards, based on R520, RV530 and RV515 chips, feature hardware acceleration of decoding video in H.264, MPEG2, MPEG4, VC-1 and WMV9 formats. Hardware acceleration of H.264 decoding is especially important as the next formats of optical media, HD-DVD and Blu-ray, will use it as one of the main formats for storing video. While MPEG2 and WMV9 decoding is already supported by video chips, H.264 decoding has not yet been supported up to now. ATI video chips take up part of H.264 decoding job, which is usually performed by a CPU. ATI RADEON X1000 chips supporting AVIVO technologies use hardware acceleration of motion compensation and deblocking filtering, which significantly reduces CPU load. Judging from the current loads and decode efficiency, ATI distributes system capacities for firmware H.264 decoding for several levels of its chips: the optimal format for RADEON X1300 cards is 480p (progressive 720x480), for X1600 - 720p (1280x720), for X1800 - the current maximum, 1920x1080 (1080p). We are assured that hardware acceleration of H.264 decoding will be improved in the next drivers. Both companies, ATI and NVIDIA, announced in Autumn 2005 that they would soon offer hardware support for H.264 decoding. This format is so new that it had no standard API for hardware DXVA. Cyberlink decoder has been recently released, it was developed in cooperation with ATI to use hardware features of the new series of video cards. The current version of the decoder, which uses hardware features of ATI X1000 chips to decode H.264, Cyberlink H.264 video decoder, reduces CPU load when playing back such video clips. We shall review it in a separate article. According to the manufacturer, this version is rather buggy. Using hardware acceleration for decoding H.264 together with 3D features of the card may cause operating instability. Some video clips with a high bitrate do not play smoothly, there are some pauses in video playback. It all will be fixed in time. Our quality and performance analysis of decoding all popular formats by video chips with AVIVO support is in progress. Post processing is all additional image processing to be done after video is decoded. This stage is also very important for high-quality displaying video and to improve its quality. In case the source is interlaced video with two fields and the display is progressive (for example, if a TV signal is displayed on a usual monitor), post processing quality is important for high quality playback. Other examples of post processing, except for de-interlacing: scaling, color correction, noise reduction, deblocking. Except for improved de-interlacing, AVIVO introduces another post processing type - Temporal Recursive De-Noise. X1000-series chips use hardware noise reduction filters for playing noisy video fragments of bad quality. Unlike decoding, post processing is not limited by a strict description, manufacturers use various algorithms and post processing methods. Post processing quality can be evaluated only subjectively, it's very difficult to evaluate its quality and efficiency. De-interlacing is a process to convert interlaced video into the progressive format. It's necessary, because the majority of display devices (all computer monitors) are progressive devices. That's why any interlaced video should be converted to the progressive format, this post processing stage is called de-interlacing. De-interlacing used to be important mostly for MPEG2 video on DVDs. And now it's getting important for the 1080i video format, which has become one of the most popular High Definition formats. The best de-interlacing methods, yielding the highest quality, are complex. There are no simple ways to do this job to eliminate artifacts in all cases. Old de-interlacing methods, simple and non-adaptive to motion speed changes, are becoming a thing of the past, providing not the best quality. Modern video chips use complex de-interlacing, so called adaptive methods. Adaptive de-interlacing methods selectively cut pixels, based on information about motion in a frame. Before AVIVO, ATI products already used adaptive methods. But it's R520, RV530, RV515 video chips supporting AVIVO, where the company introduced the advanced method - vector adaptive de-interlacing. This improved algorithm resembles the new method in NVIDIA PureVideo - spatial-temporal. In brief, it works in the following way: the algorithm selects data to build a progressive frame from either the raw field data, when motion is detected to be low; in case of fragments with fast motion, it uses video data that is interpolated along several vectors, which provides the greatest amount of details to the progressive frame. Vector adaptive de-interlacing removes the comb effect very well even in traditionally difficult scenes (for example, diagonal lines at a small angle, or flying colors ) without much quality losses and blurring. AVIVO technology also boasts of improved scaling algorithms. Scaling video is one of the critical steps in this stage of the pipeline, which maintains high quality before displaying video. In most cases a video resolution does not match a physical resolution of the display device, so the video should be scaled to the required resolution. The scale engine uses video data in the initial resolution and interpolates it into the resolution, required by an application. High-quality video scaling (up or down) retaining maximum details and reducing aliasing artifacts is a very important task, which was taken into account by ATI when it developed AVIVO. Unlike NVIDIA's approach with its separately sold PureVideo decoder, ATI continues to perfect processing methods in its drivers. Except for the improved de-interlacing, AVIVO has also brought a multi-format method for detecting and correcting 24 frame/sec video converted into video with 60 fields a second (3:2 pull-down). 3:2 pull-down correction removes fields that were artificially inserted during this conversion. The innovation consists in processing video on the level of drivers without installing special decoders. Possessing flexible programmability, the new R520, RV530 and RV515 video chips use new methods for detecting formats in order to use the 3:2 pull-down correction for any video format. To activate this mode, enable the "3:2 pulldown" option in driver settings - Catalyst Control Center. In order to output high-quality data from the video pipeline, a modern video chip must possess flexible support for various display types, offer a wide choice of analog and digital connectors supporting maximum resolutions and color depth. High precision gamma-correction. Gamma-correction unit works with input data of 8-16 bit per color component. Color correction. Full color correction is done for each pixel, both color conversion (from RGB into YPrPb and vice versa) and color correction are used. Scaling. Interpolating the original resolution up or down to match the output device. High-quality filtering in ATI products uses up to 60 samples (10 horizontals at each of 6 lines). Dithering - as all calculations are performed with 10 bits fidelity, the output width should be reduced to 8 bits or 6 bits per color component for a desktop monitor or a notebook display. All RADEON X1000 series video cards are equipped with at least one Dual Link DVI, the RADEON X1800 card has two Dual Link DVI ports. The second Dual Link DVI port can also be installed on cheaper cards, based on RV530 and RV515 chips. But the company decided to use one D-Sub and one Dual Link DVI on such cards, as analog connectors are still used more often in inexpensive systems. All the new ATI chips contain two built-in dual-link TMDS, thus, you can connect two LCD displays of high resolution. Each of the Dual Link DVI ports supports resolutions higher than 1920x1200, up to 2560x1600. This feature is very useful for such models of large LCD monitors as Apple Cinema 30" and other similar monitors from IBM, Viewsonic, EIZO Nanao, and Iiyama. Another serious improvement, to be available in new video cards, is a completely 10-bit video pipeline that uses 30-bit representation of RGB colors at all stages: gamma correction, color correction, scaling, dithering. As we all remember, Matrox engineers were the first on the market to offer 10-bit video pipeline in the Parhelia series cards. And now ATI also offers this support. Previous video chips from ATI were also equipped with 10-bit RAMDAC, but the rest of the pipeline used to be 8-bit. And now the pipeline has become completely 10-bit. So, we have reviewed components of the AVIVO technology, presented by ATI in its latest RADEON X1000 series of video cards. I can't say they are all new and have appeared on the market for the first time. Most of them are improved technologies of the previous generation, combined with new ones in a single marketing suite. Of course, it contains a lot of innovations as well. High-quality video capturing, progressive de-interlacing method, hardware acceleration of decoding the promising H.264 video format, firmware encoding, new displaying features - these are all very interesting innovations. Together with old features improved, we get an integral product that is intended to improve quality and performance of a video pipeline. Even if not everything offered by the company is implemented so far, AVIVO is the another step in the right direction. A rich set of technologies for working with video content, video output to multiple display types - it all makes AVIVO technologies very attractive to those who are interested in maximum video quality. This suite involves the entire range of the video pipeline operations, from capturing and encoding to outputting video to a physical interface connector. Each stage of the pipeline is improved compared to the previous generations of video chips. What is also very important, all AVIVO features, supported by the top chip of the R520 series, are also supported by the other inexpensive chips of the new series. That is all the cards, from RADEON X1300 to RADEON X1800 XT, support all the above mentioned features of the AVIVO technologies.